The LEGO Neighborhood Book will get you wanting to build all the buildings! Who wouldn’t want to build their own LEGO neighborhood – right?! 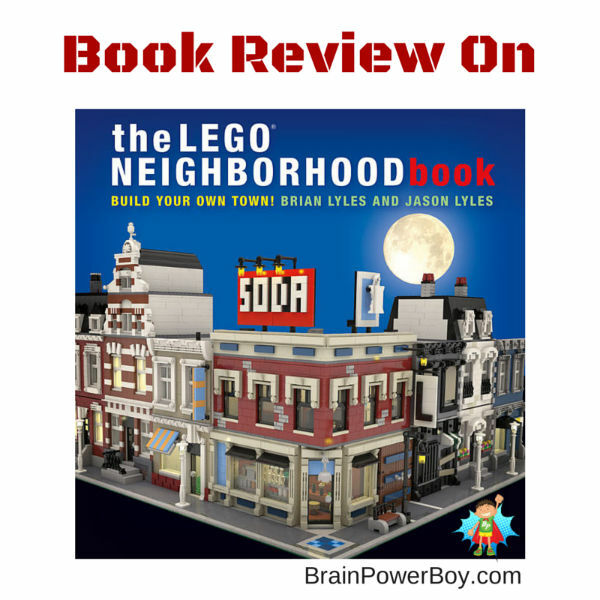 Brian Lyles and Jason Lyles are brothers and the author’s of The LEGO Neighborhood Book. You and your boy will get so many great ideas you won’t want to wait to get started. Be sure to check out our other LEGO book reviews in our Best Books for Boys list. This post may contain affiliate links which means I may receive a small commission, at no cost to you, if you make a purchase through a link. All opinions are my own and I share things I think would be of interest to boys. Special thanks to No Starch Press for providing a review copy of this book and for the awesome images. All opinions are my own–of course! My son built a LEGO house long ago and he just keeps adding to it. LEGO houses have a lot of potential for creativity and storytelling. We have played with his house a lot and always have fun. This book is a great place to start if you want to learn more about building buildings. The buildings are in minifig scale which is so nice as the minifigs can fit on the sofas and move about the house easily. The authors cover everything from base size, to connecting the buildings, to making a sidewalk and building up the levels, to the ever important design essentials. My favorite part of the book, and the part I think boys young and old will enjoy, is the selection of small builds for inside your houses. We are excited to try some of the ideas in this book for inside my son’s LEGO house. The LEGO Neighborhood Book has a lot of building options. There are different styles of TVs, shelving, sofas, chairs, and plants. There are kitchen items, beds, and stuff for the kid’s room. There is lighting, art, and even a toilet! Instructions are not included for all of these builds but most look pretty easy to figure out if one has the pieces. Having all the pieces can be an issue. The small builds are totally doable if your boy has a decent collection of LEGO. You may need a few specialty pieces (we get ours from the LEGO Pick a Brick shop) or you can substitute a different piece. If he wants to build the houses, well, that is another story. There are a Lot of pieces in the houses! It could get pretty pricey if you needed to buy the majority of the bricks required for a specific house. See a few solutions to this below if you really don’t want to spring for that many pieces. 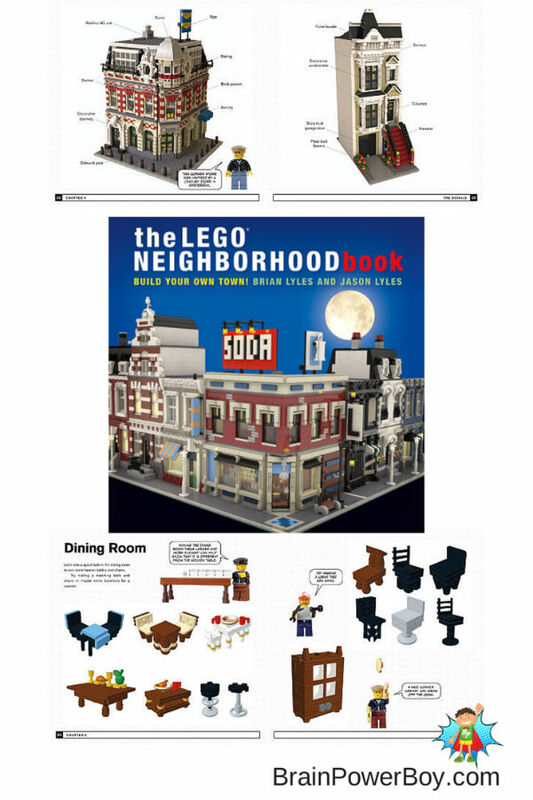 The last half of The LEGO Neighborhood Book features a very detailed corner drugstore with directions and three variations of a house. We won’t be making those but I do think we will use some of the techniques they show in the directions for those builds and that is why I still recommend the book. Exactly 200 pages long and with full color layout this is a substantial and well-done title. If you have been around Brain Power Boy for a while you know that I am very fond of No Starch Press (and no, they don’t pay me to say that! ;p;) I just think they do a really nice job on their books and put out neat titles that boys will like. Overall, I really like this book. It has a great selection of ideas and while there are no step-by-step instructions for the majority of the small builds I think boys will enjoy making some of those items and/or doing their own take on them. I also like that they use real architectural names for things in the book–a little extra learning there. They list the book as for kids ages 10+. I think that depends on the level your son builds at. Younger boys can certainly build many of the accessories. If you don’t feel you want to build the bigger items in the book due to cost, I would grab a few of these sets and pair it with this book. They can then build the accessories for these houses and also learn a lot of new techniques. The smaller LEGO Modular Home is the best deal though it is not as detailed as the other two. Let me know what you think of The LEGO Neighborhood Book: Build Your Own Town! by Brian Lyles and Jason Lyles by leaving a comment below. I hope you will pop over to see the Best Books for Boys list which is growing fast and our LEGO page with a lot of fun LEGO stuff. Hey, if you want to read more about the brothers who put this book out, be sure to take a quick moment to check out our interview with them. Oh my goodness! I had no idea you could make such elaborate houses out of Legos! I love the Victorian look of some of the architecture! Susan, You simply wouldn’t believe the wonderful things they make from LEGO. Yes, the houses are quite awesome. I have a LEGO board and I am always amazed at what I find to put on it. Thanks for stopping by! We were at the library yesterday looking for something just like this! I’m so excited read your description. I’m pinning this and headed over to ask the grandparents to put this on the Christmas list for our little guy. Thank you! So glad to hear you like it that much. Yes, building your own city would be quite awesome! Love this! I much prefer to build with ‘plain lego’ rather than sets so you can let your imagination run wild! I used to feel that way too. However, now that we have a lot of sets, I noticed that they have super cool pieces in them so I am changing my tune on the value of sets. There are a lot of great ideas in this book though for sure.